For almost 30 years, astronomers and astrophysicists have been looking for ways to do Astronomy with neutrinos to learn about the most violent and energetic phenomena of the most distant Universe. On July 12th it was announced that this may have been achieved with the identification of the origin of a very high energy muon neutrino (energy ~ 300 TeV) observed on September 22, 2017 by the IceCube collaboration. This collaboration has built a detector of 1 cubic kilometer distributing thousands of photosensors in separated holes melted in the Antarctic ice at a depth of 1.5 km. Neutrinos being neutral particles and almost massless, move at almost the speed of light and rarely interact with matter. These “ghostly” particles reach the Earth pointing back right in the direction of very distant objects where they were produced being the “smoking gun” of cosmic-ray acceleration in the astrophysical sources. The neutrino that has been observed has about 40 times more energy than the accelerated protons in the Large Hadron Collider at CERN in Switzerland. This detection, sent as an automated alert by IceCube around the word, allowed multiple observatories of electromagnetic radiation to search for its source. The Fermi gamma-ray detector satellite found that the neutrino likely came from a very distant (z ~ 0.34) “blazar” named TXS 0506+056, a type of extraordinarily bright galaxy that obtains its energy from the gravitational energy of the supermassive black hole at its center, releasing it in the form of particles and radiation from radio waves to the most energetic gamma rays. 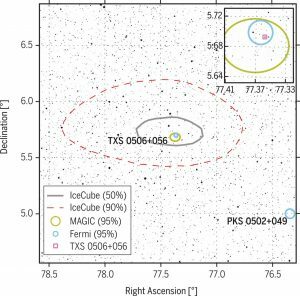 In fact, the MAGIC gamma-ray imaging air Cherenkov detector, prompted by the IceCube alert, discovered that TXS 0506+056 is also a source of gamma-rays of energies up to a few hundred GeV. This observation allows us for the first time to learn new things about these astrophysical sources outside our Galaxy thanks to neutrinos. 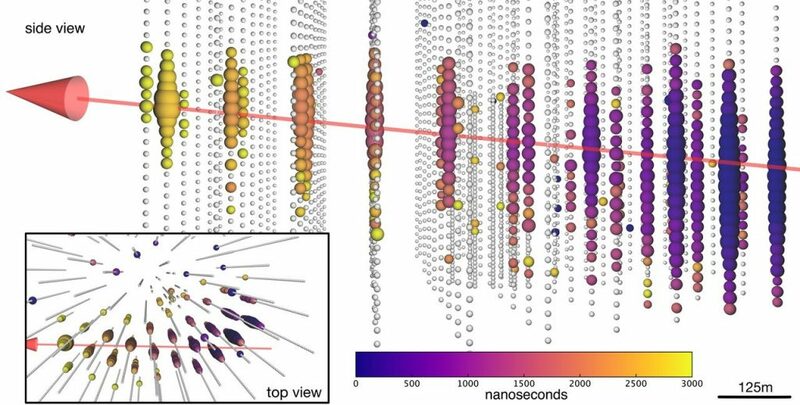 Although neutrinos associated with the Supernova 1987A were detected 30 years ago, this time we are seeing neutrinos 10 million times more energetic and coming from a source at a distance 30,000 times greater. Above a few hundred TeV however the gamma-ray radiation can only come from inside our Galaxy and neutrinos turn out to be the only astronomical messenger of the very-high and ultra-high energy processes in the Universe. This observation establishes the beginning of the era of extra-galactic neutrino astronomy. In addition, it is a paradigmatic example of another new trend, the multimessenger astronomy, in which telescopes and other instruments such as the IceCube Observatory, Fermi and MAGIC detect particles and radiation from the same source. The multimessenger approach also had a spectacular milestone last year with the detection of gravitational waves and electromagnetic radiation from the collision of two neutron stars. These discoveries will undoubtedly brand the field of astronomy for the next decades. A blazar-type galaxy that produces high-energy neutrinos can also help to solve one of the oldest mysteries of Particle Astrophysics: the origin of ultra-high-energy cosmic rays. Although cosmic rays were discovered by Vitor Hess in 1912 and later in 1939 Pierre Auger discovered that they could reach energies in excess of 1000 TeV, we still do not know the mechanism that allows accelerating these particles that arrive constantly to Earth with energies more than ten million times higher than the protons at the LHC. Extreme objects such as neutron stars, hypernovas, gamma-ray bursts and black holes in the center of galaxies are considered as possible candidates. If the results of these works, published in seven articles, two of them in Science (see below), are correct, the blazars may be the first confirmed source of these cosmic rays and could account for a fraction of them. The Galician Institute for High-Energy Physics (IGFAE) has a line of research in Particle Astrophysics focused on the study of cosmic rays and ultra-high energy neutrinos with a very visible participation in the Pierre Auger Observatory in Argentina. The Auger Observatory can also detect very high energy neutrinos by studying highly inclined air showers that reach the Earth almost parallel to the surface of the Earth, a task led by the group of the IGFAE. The blazar TXS 0506+056 is in the field of view of the Auger Observatory. The Auger Collaboration has studied this blazar as part of their ongoing point source analysis and have not found any neutrino candidate. It should be noted that the threshold of about 1017 eV (100,000 TeV) for neutrino detection with the Auger Observatory is much higher than the energies of the neutrino reported by IceCube. The implications will be discussed in a forthcoming article. The IceCube Collaboration, Neutrino emission from the direction of the blazar TXS 0506+056 prior to the IceCube-170922A alert. The IceCube Collaboration et al., Multimessenger observations of a flaring blazar coincident with high-energy neutrino IceCube-170922A.